Starfire International was founded by its President, Dr. Glen Swartwout, with Mr. John Moylan. A network marketing company offering a comprehensive array of health products, Starfire International grew to over 1,000 distributors and about $1 Million a year in sales. In a highly competitive industry where most companies do not even last a year, Starfire offered access to health products and education for over 8 years. Dr Swartwout focused on product research and formulation as well as health education, including extensive writing and production of audio and video programs. 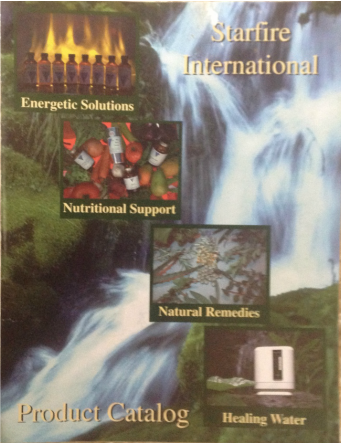 Product lines included Nutritional, Herbal, Homeopathic, Oral Chelation and other natural remedies, personal care, skin & hair care, water filtration and ionization (Microwater), air ionizers, full spectrum lighting, electromagnetic pollution detection and remediation supplies, radiation-free smoke alarms, natural insecticides, books, software, and exercise equipment (soft bounce rebounder). Some of the original Starfire formulations and products are still available through Hilo Oasis or House of Gold Health Products. Dr. Glen demonstrating his method of Biofield Kinesiology based on years of experience with the German Electroacupuncture including the Vegatest Method and Electroacupuncture According to Voll. These methods are very useful and efficient for natural product development and quality control purposes, as well as clinical healing. By selecting remedies that balance the body's biofield, as measured in the acupuncture meridians and electroacupuncture vessels, the body is supported in a state of greater coherence, healing more rapidly and efficiently. In nearly three decades of working with this process of Accelerated Self-Healing through Biofield Analysis, Dr. Swartwout has observed many fascinating cases of healing in chronic illnesses that otherwise do not improve, including several cases of blindness. These were cases of wet macular degeneration considered the leading cause of irreversible blindness in our culture. In two cases documented by Harvard trained Retinologists, functional vision was restored with this approach without stem cell injections and without laser surgery. Both doctors stated that they had never seen such a healing response before.